Thanks to everyone who made our 10th anniversary celebration such a memorable occasion! It was great to be with so many inspiring people from neighbourhoods across the capital and from a wide range of different communities. The Rt Revd Dr Michael Ipgrave, Bishop of Woolwich, who was our first speaker, with Catriona Robertson (LBFN Convener), Aliya Azam (Al Khoei Foundation) and Steve Miller (Faith-based Regeneration Network). View the full set of photos on Flikr and download the programme booklet, which includes links to local groups across the capital. 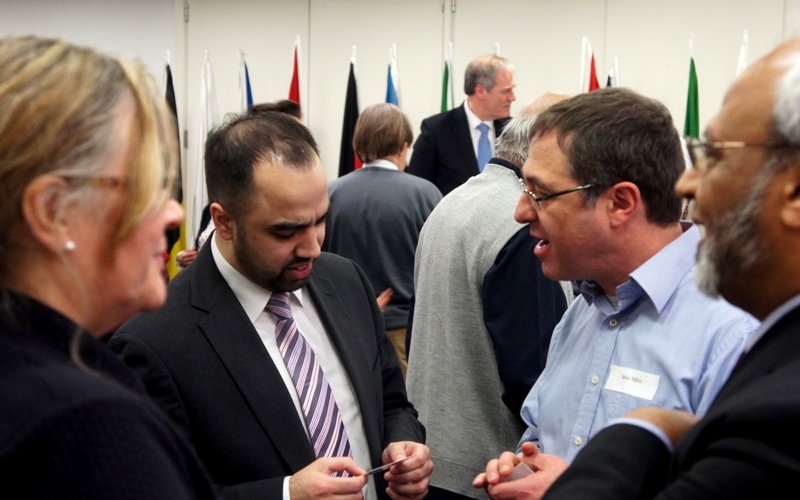 LBFN friends from nearly all the London boroughs and from over 10 major religious & belief traditions gathered together at Europe House in Westminster. Officers from local authorities and the police service joined the celebration. 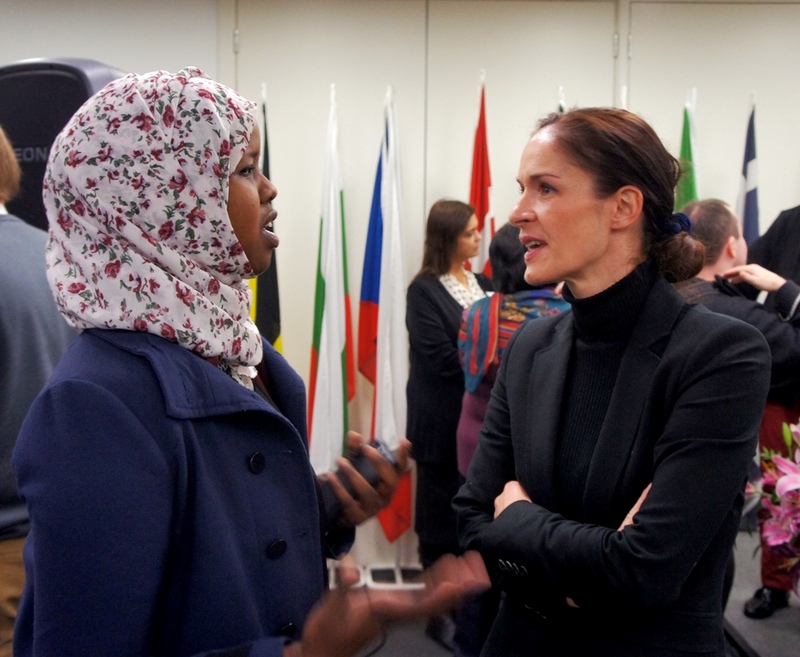 The Home Office, HM Prison Service and the Department for Communities and Local Government were also represented. We heard inspiring stories from many of our members. It was heartening to hear of the excellent work that takes place, mainly under the radar, in so many parts of London. Local religious and community groups working in partnership – with each other, with public agencies, with government and with academic bodies – was a major theme. As was the importance of building trust, sharing experience and expertise – and finding practical, smart and strategic solutions together. Dr Haider Ali (left) of the Open University Business School reported on the initial findings of his research this year into the work of LBFN members. He highlighted the complexity of our work, the inherent tensions within it, the benefits of co-producing public services and the importance of values being at the heart of all we do. Download Dr Ali’s handout here. 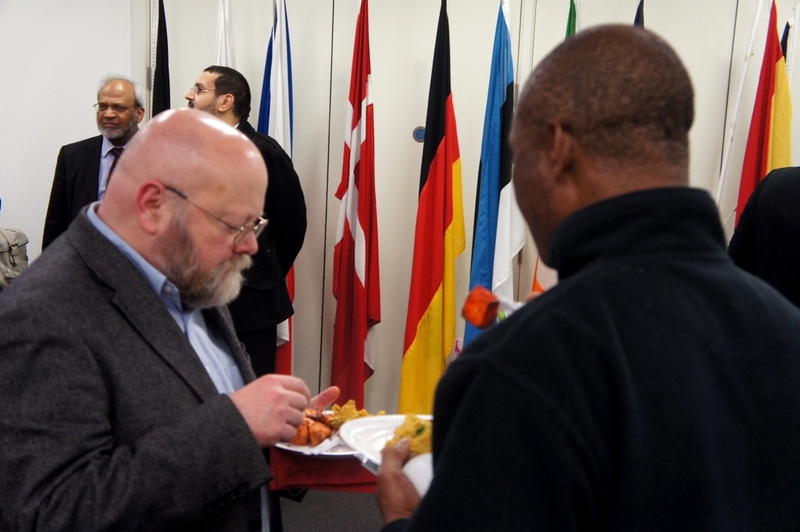 The European Network on Religion & Belief, which LBFN has been closely involved in setting up over the past three years and which is now registered under Belgian law, was celebrated. 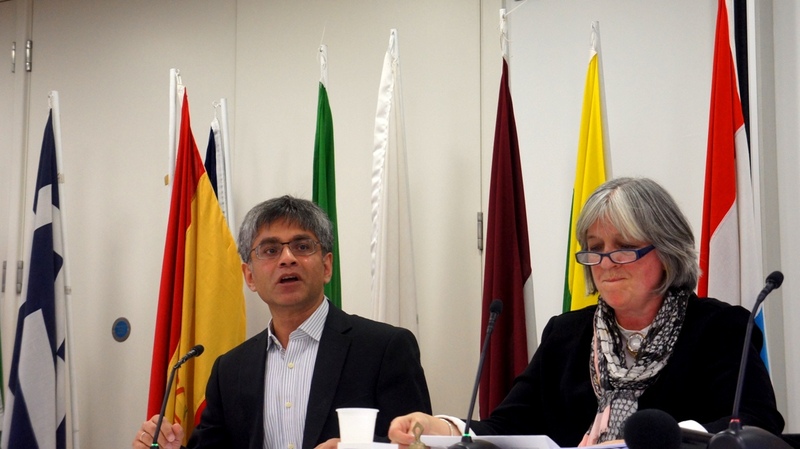 Rachel Stone, Dr Syed Kamall MEP’s Chief of Staff, brought messages of support and we received a warm message from Han Steijnebrugh in the Netherlands, Chair of Seric Europe. Bishop Michael spoke about the benefits of making links across the continent and of recognising the historic complexity of European life. 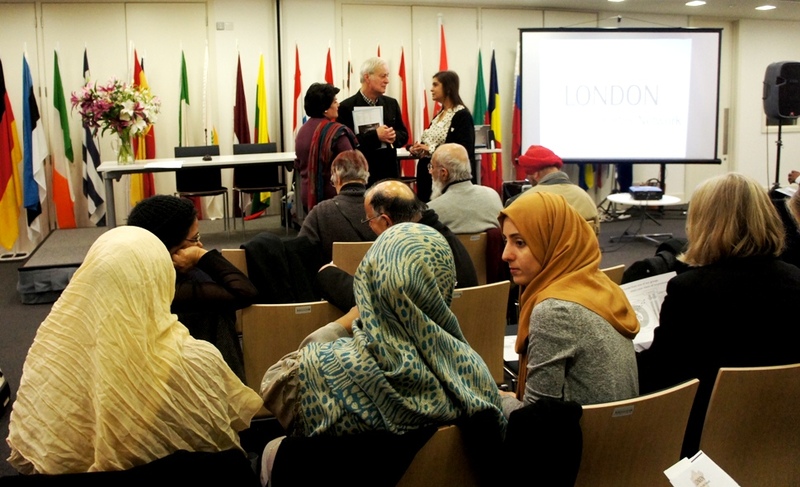 The London Peace Network, which LBFN launched to promote the 2012 Olympic Truce, co-ordinates local initiatives, including activities to mark the UN International Day of Peace in September each year. 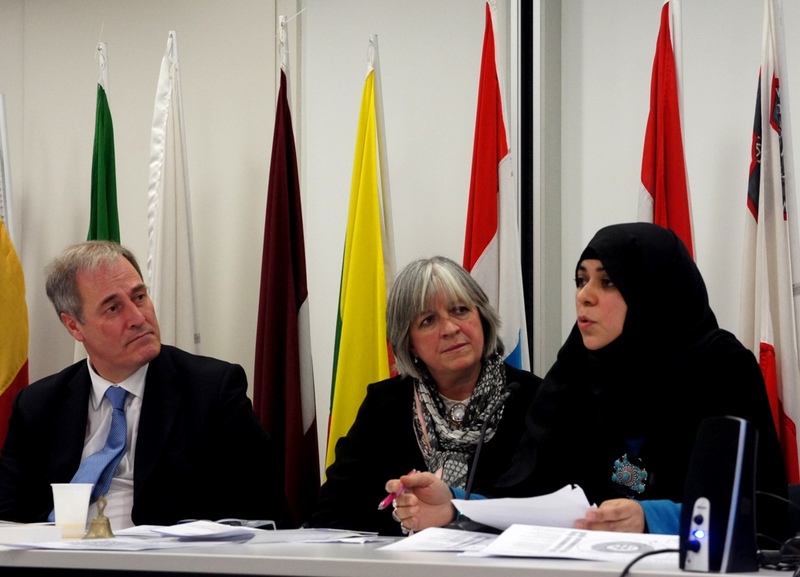 Lord Michael Bates (left) is our patron and Aliya Azam (right) has organised many peace-building events at the Al Khoei Foundation and as part of Brent Interfaith. 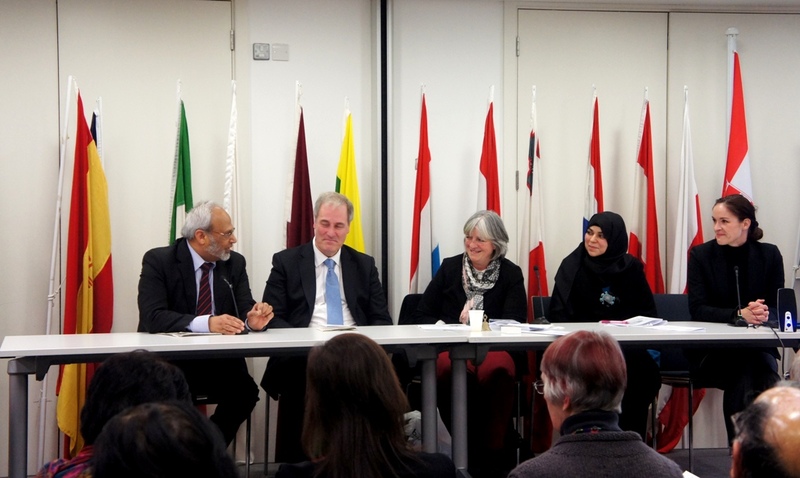 Dr Shuja Shafi (Harrow Mosque & Muslim Council of Britain), Lord Michael Bates, Catriona Robertson, Aliya Azam and Rosalind Miller (Islington Faiths Forum). Many of us stayed on for something to eat and a chance to catch up with old friends and to meet new ones: Saad Mahmood and Steve Miller (centre). 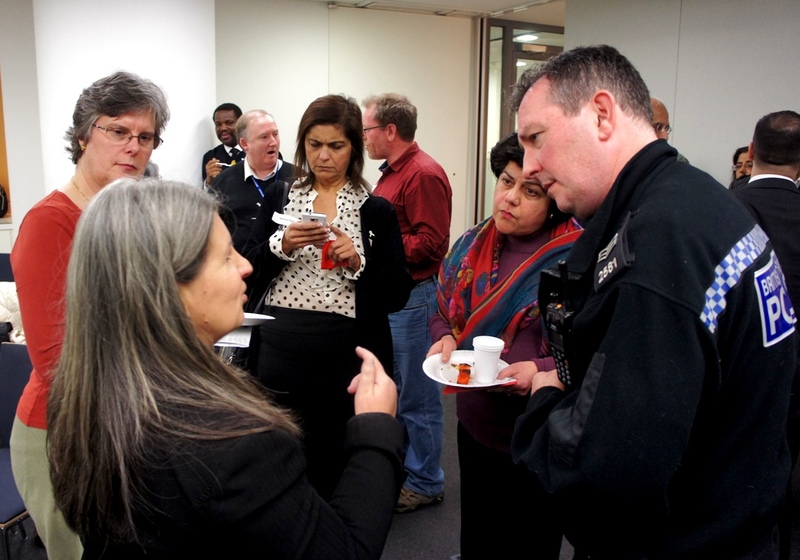 The British Transport Police, who have hosted LBFN meetings at their HQ in Camden, were amongst our guests. The picture includes members of Enfield Faith Forum, Susanne Mitchell (Presence & Engagement Network – left), Jan McHarry (Tower Hamlets Inter Faith Forum and Faith-based Regeneration Network – lower left) and Sgt Keith Johnson (right). 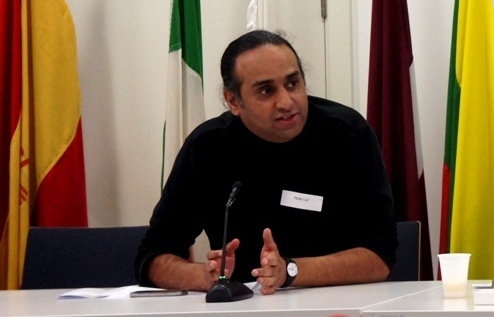 Malik Gul (Wandsworth Community Empowerment Network) talked about his co-production work with Wandsworth Council and the local NHS, training local religious leaders to support early intervention and redesigned pathways. Public agencies, he said, will struggle more with preventative actions without the support and engagement of local religious and community organisations. Roz Miller of Islington Faiths Forum (right) spoke of her pioneering work on mental health and poverty and of the collaborative relationships she has built with the local council and NHS. 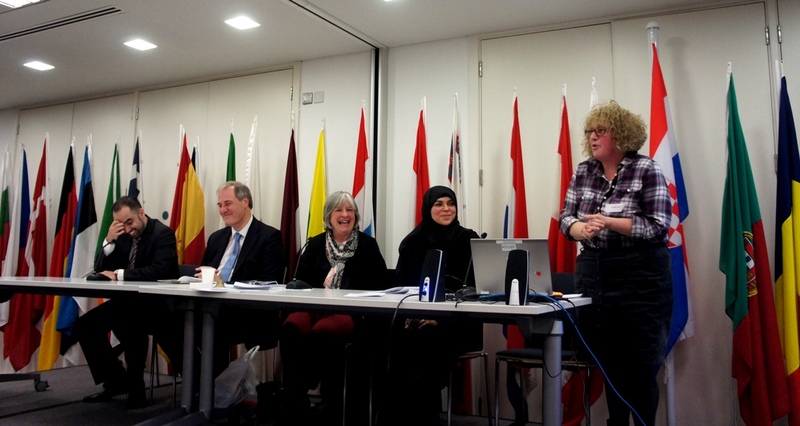 Zahra Imame (third left, seated) works with local groups across London and facilitates ‘Conversations of the Soul’ with the Christian Muslim Forum and the Near Neighbours Programme. We had a wonderful bunch of people sharing their stories and ideas, with no shortage of humour. 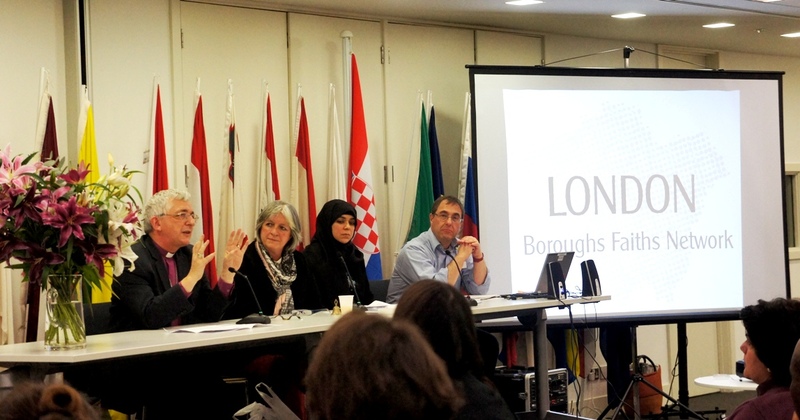 Leonie Lewis (right) spoke on behalf of the Jewish Volunteering Network and Faiths Forum for London (LBFN has been co-opted to the FFL Council in 2012 and 2013). 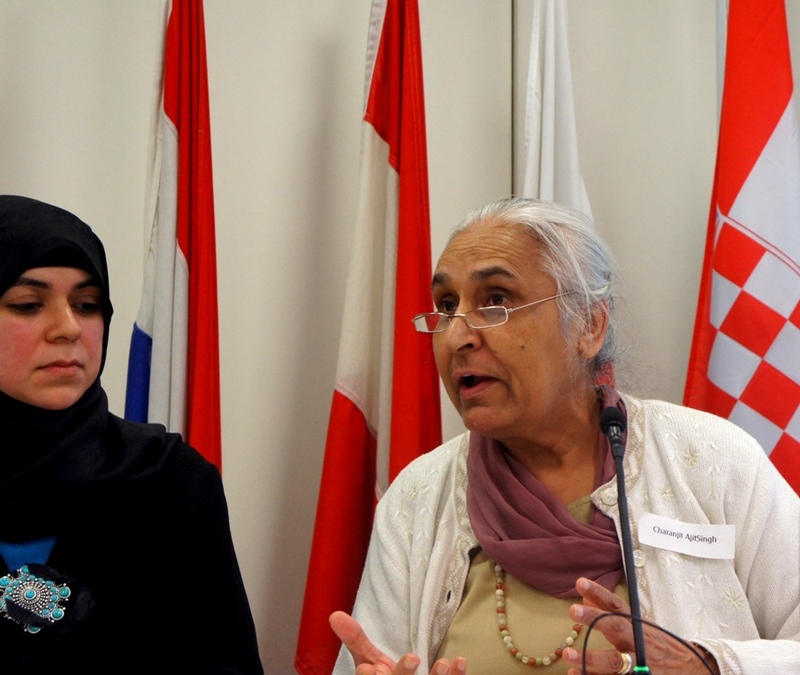 Charanjit AjitSingh (right) of Hounslow Friends of Faith talked about her work on holistic care with the clinical staff at the Middlesex Hospital and of the series of Good Neighbour Days which the Friends organised with Hounslow Council during Inter Faith Week. 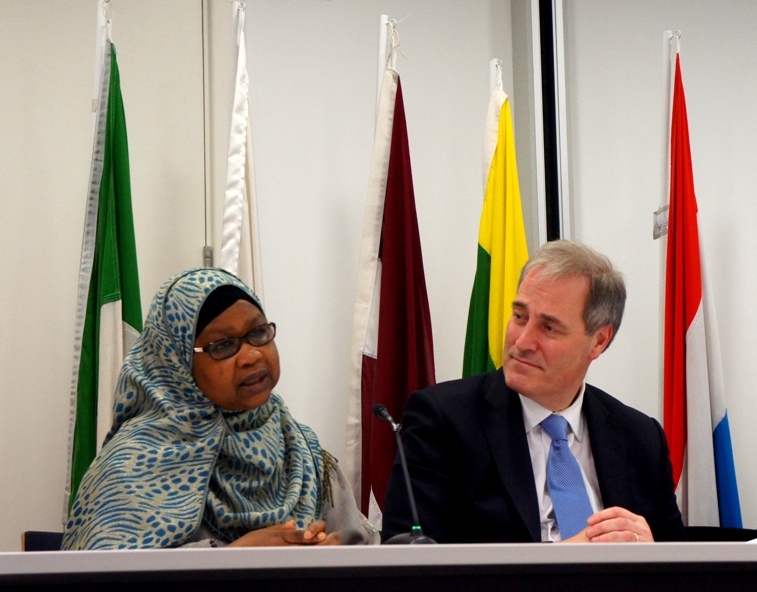 Saadat Yusuf (left) of Muslim Sisters Jamaat talked about British links with Nigeria and about the vitally important work of supporting young mothers. Rabbi James Baaden of Sha’arei Tsedek (North London Reform Synagogue, which marked the UN International Day of Peace 2013 with the London Peace Network) and Inno Amadi (Haringey Council). Front row: Revd Francis Parker-Allotey (Enfield Faith Forum), John Woodhouse (Westminster Cathedral Inter Faith Group), Balbir Singh Bakhshi (Greenwich Faith Community Leaders), Rashid Laher (South London Inter Faith Group) and Bessie White (Hounslow Friends of Faith). Back row includes Jan McHarry (Tower Hamlets Inter Faith Forum & Faith-based Regeneration Network), Charlie Ryder (HMP Wandsworth), Andrew Cameron (Southwark Cathedral), Matthew Trigg (Westminster Council) and Brian Lovell (St Stephen’s Walbrook). 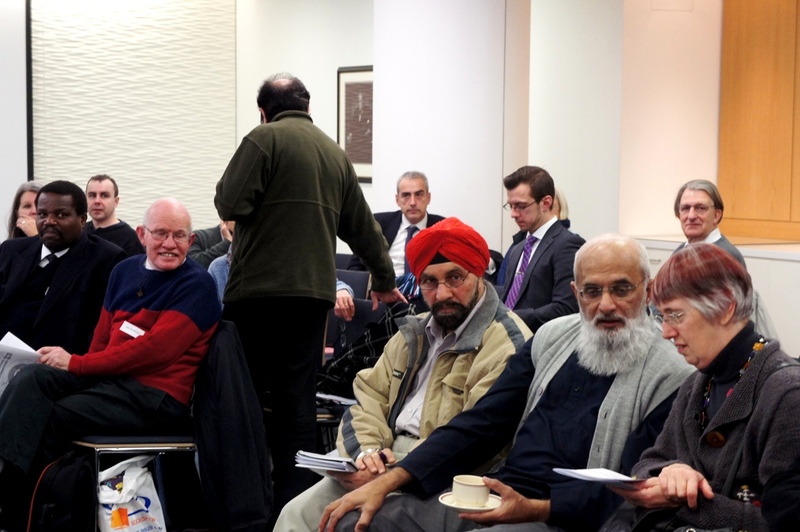 Rizwan Alibhai (South London Inter Faith Group) is standing. Video clips will be available soon. Many people have been in touch since 25th November: contacts, emails and new ideas for partnership and joint working have been buzzing across London. There is a lot of energy amongst those of us who were at Europe House – and also amongst the many who couldn’t make it but were with us in spirit. Theology for Practitioners was popular this year and links to our previous work on multifaith spaces. The London Peace Network is busy making plans for 2014 and our continued links with European groups & the EU bring further opportunities for working in partnership beyond the UK. Engaging strategically with our local councils, the police & prison services; bringing local communities and expertise together with NHS professionals to overcome health inequalities; concerns about poverty, discrimination and injustice; active peace-building and promoting the strength and prosperity of our local neighbourhoods; social action and contributing to the evolving public conversation on religion, belief and our public services – these are all close to our hearts. At our next meeting (probably late January or February) we’ll have an opportunity to see where this takes us. By then, our registration process should be nearing completion. As ever, if you would like to be put in touch with someone with similar interests, or if you have something you’re keen for us to tackle or to consider at a future meeting, please do not hesitate to get in touch. This entry was posted in London, Social Labs and tagged #lbfn10, Bishop of Woolwich, DCLG, Europe House, OU by Catriona Robertson. Bookmark the permalink.